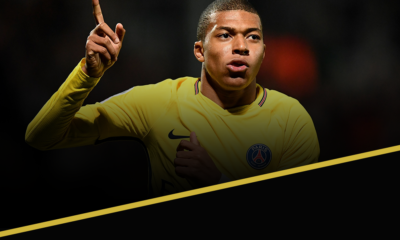 Eric Devin provides a detailed analysis of the first leg of the Champions League quarterfinal that finished PSG 2-2 Manchester City. While admittedly Manchester City’s 2-2 draw with Paris Saint-Germain at the Parc de Princes was decided on a few individual moments, (Joe Hart’s save of Zlatan Ibrahimovic’s penalty, Fernando’s errant pass, etc.) there is still a good deal to be gleaned from the match tactically ahead of Tuesday’s return leg. The tie is still firmly in the balance, and will surely be decided by who can better learn from their mistakes. Bearing that in mind, this analysis seeks to not only ascertain both sides’ missteps, but also offer possible remedies. The obvious starting point is that both teams were missing important players, Marco Verratti for the hosts and Vincent Kompany for the visitors. The importance of Yaya Toure and Javier Pastore, as well as that of Raheem Sterling is a matter of some debate; none of the three were locks to start. Laurent Blanc elected to continue with the same 4-3-3, with Adrien Rabiot replacing the injured Marco Verratti, and Edinson Cavani deployed on the left, where Lucas Moura had generally been in the club’s biggest matches. For Manchester City, Manuel Pellegrini continued to use the same 4-2-3-1 that has been his calling card in the English club’s biggest matches, although the return of Kevin De Bruyne meant that the Belgian replaced the injured Yaya Toure behind Sergio Aguero. In central defense, Eliaquim Mangala and Nicolas Otamendi were preferred with Kompany on the bench, the two offering a more mobile approach than Martin Demichelis. 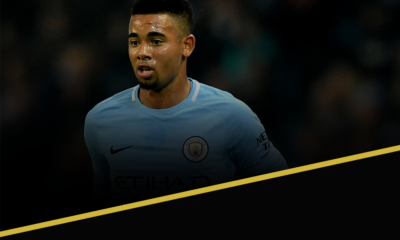 On paper, then, without their influential captain, Manchester City would have appeared to have been at a disadvantage, but could Laurent Blanc have approached things differently, particularly in midfield? Blaise Matuidi and Thiago Motta have been automatic starters, and Adrien Rabiot has come into his own this season, his fine performance against Chelsea warranting his inclusion here. However, despite the energy and drive of Rabiot and Matuidi, the French side’s midfield lacked the necessary creative spark to help facilitate the attack as they do at their best. When the midfield is fully fit, each of the trio have a defined role: Motta sits in front of the defense, acting as a shield and allowing the other two to get forward at will; Matuidi shuttles back and forth, making lung-busting runs from deep, being an auxiliary attacker when necessary; Verratti plays with a bit more bite, but also offers the team another dimension in his sublime ability to play balls over the top, offering a fruitful conduit for the pacy likes of Angel Di Maria and Moura. Javier Pastore can be deployed in a similar way, although without the Italian’s combative style. Rabiot, in counter to the absent duo, is much more direct, preferring to get involved in attack by running at players directly or playing short passes. Against slower-footed defenses, (Chelsea for example) this ability is enough to see success, but with both Otamendi and Mangala fairly fleet of foot as far as center backs go, and with the fairly dynamic partnership of Fernando (error notwithstanding) and Fernandinho offering decent protection, things looked to be quite different. And indeed, statistics bore this out quite well, with Matuidi and Rabiot being dispossessed a combined seven times, providing an equal number of chances for City to play on the counter. Normally, a three-man midfield would have the beating of a central pairing, but with Gael Clichy pushing on, and the attacking trio tracking back superbly, the bustle and energy of the Parisian midfield was to no great effect. With an errant pass between Matuidi and Rabiot the genesis of City’s opener as well, the two were well and truly off the pace, Rabiot’s goal notwithstanding. Here is just one example, with Rabiot, in this case, being caught in possession by City’s midfield duo. Having won the ball, the youngster turns and bursts upfield, but without much support. Given that PSG’s fullbacks aren’t advancing upfield, nor are his fellow midfielders, the potential runs of the front three, Cavani, (red arrow) Ibrahimovic (yellow arrow) and Di Maria (white arrow) are well-tracked, and when Jesus Navas (in circle, at bottom) comes inside to aid the Brazilians in tracking Rabiot’s run, there can only be two outcomes. Either Rabiot loses possession, as he did in this instance, or he hits the ball long before losing it, giving the attackers a fair bit of distance to cover, as well as a marker to beat. While things did improve as the match wore on, the energy and willingness of City’s midfield, in particular Navas and David Silva (3 and 4 tackles respectively) to put in a shift in tracking back meant that the energetic runs of the two Frenchmen were often for naught. In the below image, the two wide players have dropped behind the two central midfielders, allowing the Brazilians a bit more opportunity to tackle. In this instance, Matuidi is on the ball, and Fernandinho is coming forward to apply pressure, (white arrow) while Navas has dropped even deeper to cut down the angle for a potential pass wide to Maxwell. 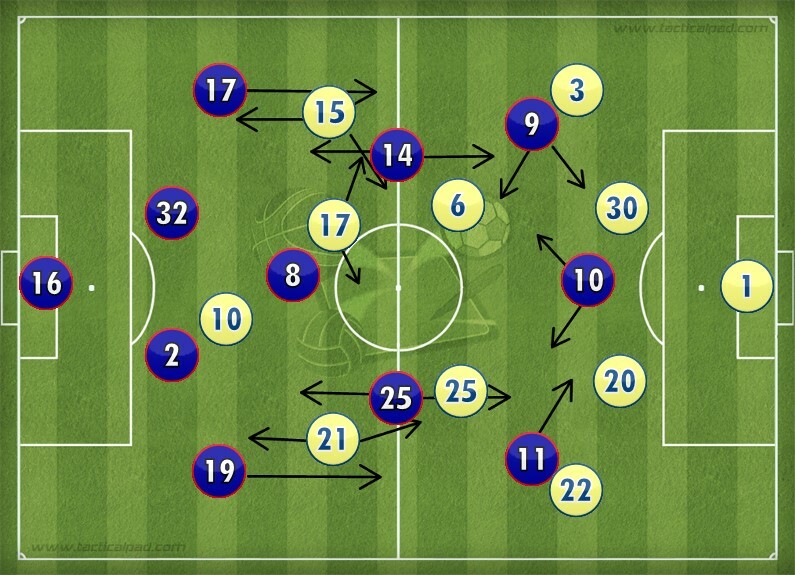 Silva has done the same on the opposite side, and not only has an effective limiting of PSG been established, but the pace of the two Spaniards makes them perfect conduits to start a counterattack, should they or one of the two central midfielders win the ball. Even Aguero and De Bruyne got in on the act, one of the pair often dropping deep to apply pressure, particularly when Thiago Motta was in possession. While the metronomic Italian still completed almost 91% of his passes, the constant interplay between Aguero and De Bruyne led to him often being caught out trying to keep pace with one of the two. 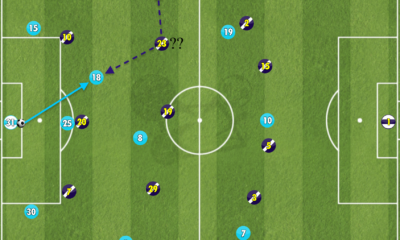 As the below image shows, with the Belgian having got beyond Motta, eager to run onto a pass from Bacary Sagna. While this particular instance eventually led to Fernandinho ballooning a shot well over from the edge of the area, it is illustrative of how the pair’s movement, constant and tricky, was influential in drawing Motta out of position and limiting the protection afforded the central defenders. With David Luiz having been booked early in the match, the floppy-haired Brazilian had to be much more cautious, and City were presented with a wealth of chances owing to the movement of their central attackers. Thus, despite having a theoretical advantage in midfield, the willingness to get about the pitch on the part of City’s attacking quartet meant that the quality and threat in possession that the hosts enjoyed was of a very low level indeed. With Blaise Matuidi set to miss the return leg owing to an accumulation of bookings, Angel Di Maria should drop into midfield in the Frenchman’s place which will give the visitors a bit more dynamism going forward, but if the attacking players continue to be as dogged as they were in the first leg, there is no guarantee the Argentine will have an easier time of it than his suspended teammate. There may be a bit more freedom for PSG with Yaya Toure likely to replace Navas, with De Bruyne shifted out to the right. That said, if the Ivorian can display a similar amount of effort, the match will still likely turn on the ability of City to apply enough pressure to disrupt the visitors’ midfield. While midfield was where the match’s outcome was decided on the whole, several other areas of the pitch deserve a closer look as well. In terms of selection, aside from Pablo Zabaleta potentially being a better option than Bacary Sagna at right back, it is difficult to argue that Manuel Pellegrini can be second-guessed in terms of his team selection and tactics, but what of his counterpart, Laurent Blanc? With Verratti and Pastore absent, midfield seems to pick itself, but the attack and right back are areas onto which some doubts can be cast, given the potential ramifications of how the hosts on Wednesday might have approached the match were the personnel to have been a bit different. With David Luiz suspended in the return leg, Marquinhos will come into the side to replace his compatriot in central defence, but should the youngster have featured at the Parc de Princes as well? Nominally a center back, the absence and then injury of Serge Aurier and that of Gregory van der Weil saw Marquinhos play perhaps a dozen matches at right back last season, as the club caught and overtook Lyon in Ligue 1 and defeated Chelsea in the Champions’ League. Granted, Aurier’s directness, pace and physicality make him one of the world’s best right backs on form, but coming back into the team after a lengthy suspension meant that there would necessarily be a bit of ring rust on the part of the former Toulouse player. Certainly not as capable going forward as Aurier, what Marquinhos would offer, however would be a much more defensively sound performance defensively, relying on adept positioning and fine tackling technique as opposed to the pace-driven Aurier. Admittedly, Marquinhos with the ball at his feet is hardly going to haunt the nightmares of opposing left backs, but given the general positional play of PSG’s fullbacks, might a more defensively sound approach have benefited the hosts more? Both Maxwell and Aurier get forward with aplomb, but too often, the two were not only caught upfield on the break, but also dragged out of position by the wily De Bruyne and Silva. 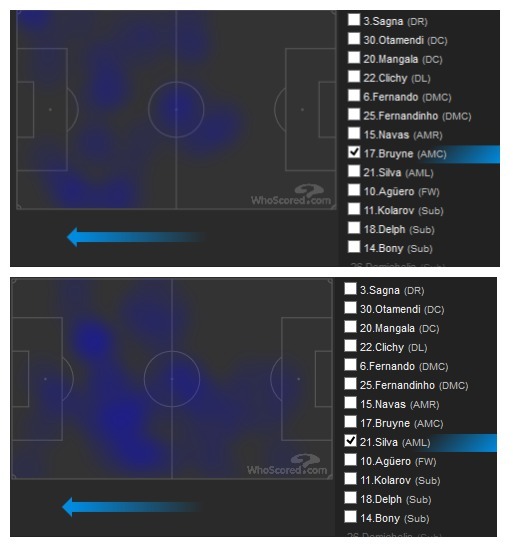 As the above heat maps show, much as Aguero and De Bruyne were able to shift positions vertically, so were the Belgian and Silva laterally. Their nominal roles as no. 10 and left wing meant little over the course of the match, and the defensive instincts of Aurier were often confused because of this. This eventually led to City’s equalizer, as Aurier’s bizarre run across the field led to his being caught out, his failed clearance falling into the path of Fernandinho. As the following two images show, the defensive effort of Silva (again) sees the diminutive Spaniard nick the ball from the right back (in circle, first image), turn infield and head towards goal. Given that Silva is the nominal left winger, Aurier gives chase, hoping to win the ball back. The City player comes inside and then lays the ball off for De Bruyne, who has moved right to afford Silva a bit more space. The Belgian then plays in Navas, who quickly shifts the ball to Sagna on the overlap. The Frenchman’s cross is decent, low and across the six-yard box, but not really near any of his teammates. Aurier, even with Silva now outside the area (red box) and not involved in the play, has not returned to his normal position, even as his presence is unnecessary in the box, with Rabiot and Thiago Silva tracking Aguero and Fernandinho’s runs. Turning to clear the cross, the right back’s studs catch to cause him to slip, and his poor clearance falls at the feet of Fernandinho, who obliges by scoring the equalizer. There is certainly some sense of this being an individual error as opposed to a tactical issue, but would a right back with more tactical discipline find himself in that position at all? Further forward, Edinson Cavani was preferred on the left to Lucas Moura, who seemed to have surpassed the Uruguayan in Laurent Blanc’s preferred eleven. A growing sample size had shown that the hulking former Napoli player lacked the pace and dribbling ability to function effectively as a wide player in a 4-3-3, and while Cavani was still a regular domestically, Moura had started both legs of the tie against Chelsea, and performed well. Not as forthcoming with his defensive effort as Cavani, Moura nonetheless has more of an ability to drag opposing fullbacks out of position, effectively swapping flanks with Di Maria and being a threat on either side. As it was, Bacary Sagna was relatively untroubled on the evening, getting forward when necessary but generally turning in a solid performance with the aid of Navas’ verticality. Similarly, Gael Clichy had a fairly straightforward evening on the left, Di Maria really only looking dangerous when drifting inside, away from the pressing of Silva. Moura and Cavani both look set to feature from the off on Tuesday, with Di Maria again replacing the suspended Matuidi in midfield, but might Blanc have given City’s back four a bit more to think about with a more dynamic front line? The tie is still firmly in the balance, but Blanc, whose teams have generally looked assured at every stage this season, stumbled badly in terms of his tactical decisions on Wednesday. If, as a result, he finds himself out of a job come the season’s end, it will be down to his own lack of imagination on the evening, and not, as some have suggested, any individual errors.